Drive Medical Deluxe Clever Lite Rollator Walker from HealthyKin.com has front wheels that can be set in either "swivel" or "fixed" positions. It includes a flip up seat with a built in carry handle. 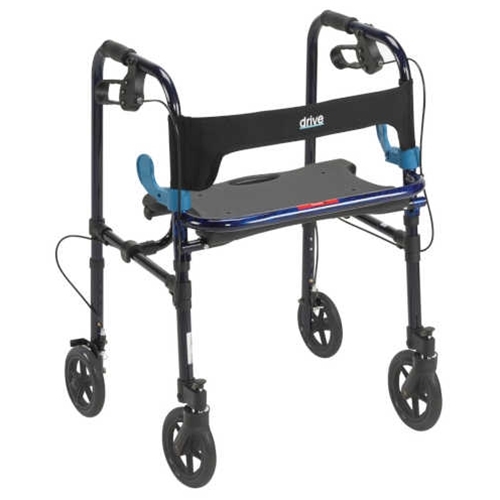 This is a superior product that has greatly extended my mobility - I now roam all over my church, the grocery store, etc. It is large enough for me (6') to use, small enough to fit in the trunk of my Chrysler 300 and light enough for me to lift it in and out! This has been a real blessing for me! This is a quality product. It extends my mobility, and allows direct access to my sink and counters. Sometimes I use the pull-down seat as transport for items. I Like the taller size, but still having trouble with front wheels moving correctly. We tried WD40 on wheels which helped some, but I was hoping this would be a better walker.